AUTO (VC) 1/Turn When your rear-guard attacks and does not hit, COST [Counter Blast 1], Stand that unit, and it gets Power+10000 until end of turn. That unit attacks your opponent’s vanguard. AUTO (VC/RC) 1/Turn When your other unit’s attack does hit, this unit gets Power+15000 until end of turn. 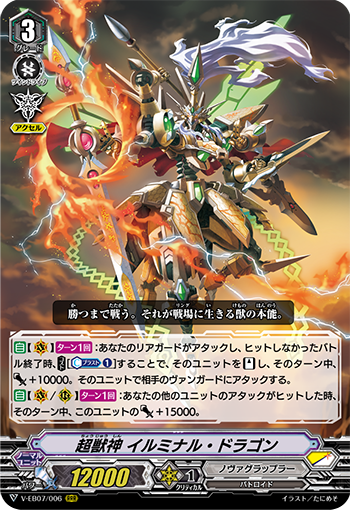 AUTO (RC) When placed during your main phase, if you have a grade 3 vanguard with “Beast Deity” in its card name, COST [Counter Blast 1 & Discard a card from hand], this unit gets Power+3000 until end of turn and it attacks your opponent’s vanguard. If that attack did not hit, Stand this unit.